The Morphy Richards Voyager 300 which has a capacity of 0.5 litres. The power consumption of the Voyager 300 electric kettle is 1000 W. This kettle has a corded mode of operation. 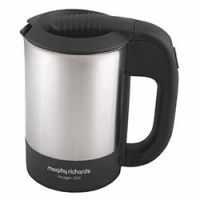 To Recieve updates and possible rewards for Morphy Richards Travel Jug Kettle - Voyager 300 please sign in. To Recieve updates and possible rewards for Electric Kettle please sign in.